Dresses, Dresses, and more Dresses! Discovering Aisle Style! Good Sunday afternoon everyone! Today I thought I would interrupt all of my recent wedding posts, for...another wedding post! I have recently discovered this super awesome UK based website that is just bursting with the most beautiful wedding dresses, bridesmaids dresses, evening dresses, communion dresses, and more! It is called Aisle Style (http://www.aislestyle.co.uk/), and if you're planning a wedding, or any other special occasion, you need to know about this website! So sit back, relax (which is probably what you're doing already! ), and indulge yourself in Aisle Style's luxurious and dreamy dresses! If you want unique, stylish dresses for your bridesmaids, without breaking their banks, look no further than Aisle Style! They have a crazy huge selection of any style bridesmaid dress you could imagine! And most importantly, your pals won't have to spend hundreds of dollars on their ensemble for your big day! My absolute favorite part of shopping on Aisle Style, is that you can build your own dress! This is so cool! To build your perfect bridesmaid dress, that is tailored perfectly to suit your style, theme, color, and the body shapes of your girls, here is what you do! -Go to the bridesmaid page. -Once you're on the bridesmaid page, look on the left hand side. There, you will find the options for price range, neckline, color, waist style, silhouette, length, body sizes, style, fabric, even dresses for different venues! Click on what you want for each category, and you will be shown every dress that comes in that color, price range, length, etc! For example, when I chose to look for dresses that are 100 pounds or less, with a sweetheart neckline, and that comes in the color pink, I have 184 choices! Take a look at just some of the gorgeous bridesmaid dresses you can find on Aisle Style! You can find their complete line of bridesmaid dresses, and build your own! I would wear this gorgeous pink dress for any special occasion I could think of! This is a stunning bombshell dress in red! I am completely smitten with this dress, that is fit for a goddess! I did not discover this website until after I was married, but if I had known of it earlier, it definitely would have been one of the places I looked! And whenever my sister gets married, I intend to have her look on here! They have the same build your own dress options as the bridesmaid dresses, and that makes it so nice to find a dress! You can look it up by season, price, silhouette, inspired looks, necklines, and plenty more! Here are some of the breath-taking wedding dresses I found on Aisle Style. ﻿This magnificent trumpet style dress is so crazy beautiful! This dress is just so adorably funky! LOVE! Ok, I realize that I do tend to flock more towards the funky dresses, but I promise that they have classic dresses too! Look below! Holy moly, I could spend hours looking at all these dresses! Is being a guest the closest you'll get to a wedding this summer? Don't worry! Aisle Style has wedding guest dresses also! Find the complete collection here, and find your perfect wedding outfit for every wedding you attend this year! And don't forget about communion dresses, promdresses, flower girl dresses, and veils and accessories! 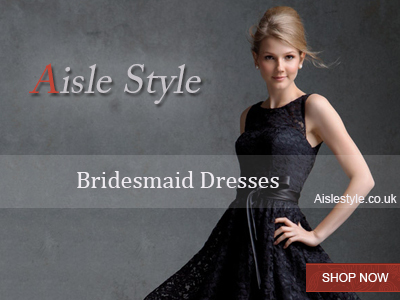 So go ahead and find your perfect dress for your next big occasion at Aisle Style! I was selected for this opportunity by Aisle Style, and the content and opinions expressed here are all my own.